I am participating in a blogger challenge along with many other dog lifestyle bloggers, and need your input with one of my first exercises.... pretty please!? Our first challenge was to determine what our top posts were from the past year. Shockingly, 2 of my top 5 viewed posts in 2015 were several years old (both of which were reviews), but even more shocking were the top keywords and phrases that people used to find my blog. This is where I could really use your feedback. We were asked to determine the top 5 phrases we wanted to be known for, and quite frankly, I'm having a bit of a hard time deciding what those key search terms should be for Lapdog Creations. 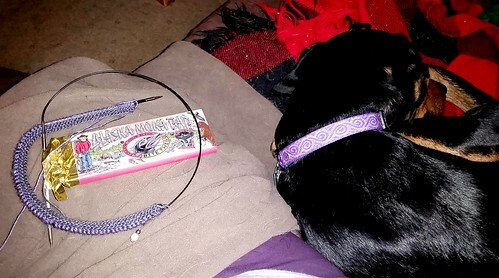 Why do you visit Lapdog Creations? What would you like to see me write more (or less!) about? I have a few terms I'm playing with - rescued dogs, dogs and knitting, dog nutrition - and of course dog product reviews will continue to be a big part of my content. If we continue on with Penny's formal training, I can include that as well. But, I'd really like to know what you think of when you think of Lapdog Creations, and most importantly what you want to read more about. Any and all feedback is greatly appreciate! It looks like you have some knitting buddies to keep you company! :) We love to visit your blog to see what the lapdogs are up to! p.s. I see you have your share button back, yay!! I love them!! I like seeing what the puppies are up to so I always read the Lapdog Blog..and of course love the pics. We check in because we feel like we know you and the lapdogs. We want to see what mischief you've all been up to. We like the reviews and the health and nutrition news. 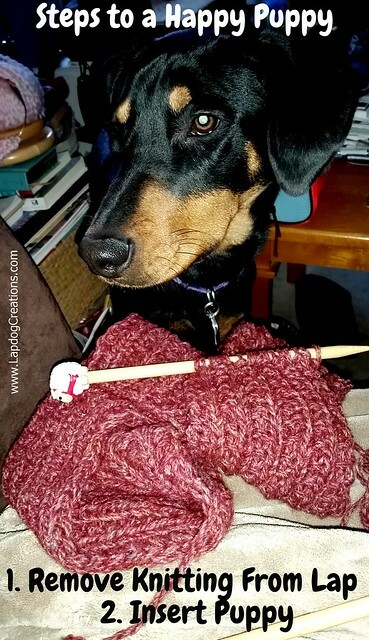 We like to see the knitting wips and see the furry models wearing the finished items. Oh yeah, Mom likes to see pictures of lobster sandwiches. I have two left hands when it comes to knitting and crocheting. Mom grandmother tried to teach me - she was awesome and I still have the the cover she made for my bed. Have you heard of the snuggles project? May be fun to come up with patterns for that? I don't knit, but I love seeing the creations of others. My 11 year old daughter is in the knitting club at school. Maybe she can teach me one day. I love your cleaner look! My daughter crochets and has made the boys their own neck scarves. I love knitted and crocheted things so I am glad that she enjoys making things for us. Love your scarf! I used to knit many years ago. I should try it again! I like the more streamlined look and I enjoy reading your blog (and looking at your snazzy neck scarf!). It is so cold, i I could use a warm afghan. Love the expression Little Friday. Thanks for linking up to the hop. 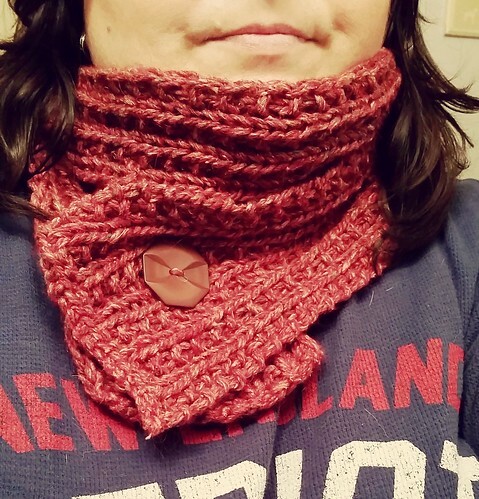 I love the knitting posts and I'm very impressed you're knitting on rounds! It's inspiring me to take a class this winter - knitting dog sweaters is SO fun. I like the cleaner look. I am not interested in knitting but like the end result. I enjoy funny relatable dog stories - Kilo the Pug is a cuddle loving lap dog. Food reviews seem to be good for search and interest. I just have you bookmarked, so I never search; sorry! 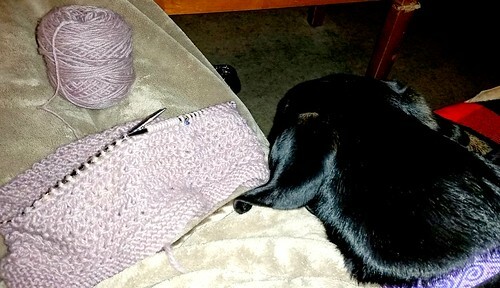 I enjoy pictures of your pups and seeing your knitting projects. Happy Friday, Nic! We has to make Mommy move her book so we (cats) can sit in her lap. The dogs are only allowed to sit in Mommy's lap if she is sitting on the ground. They are huge and only their heads fit in her lap.